The flowers of oriental poppies are fascinating, whether in bud or in bloom. There are close to 100 species of poppies, some are annuals or biennials, others, like the Oriental poppies, perennial. Most of the Oriental poppy selections on sale today are hybrids. 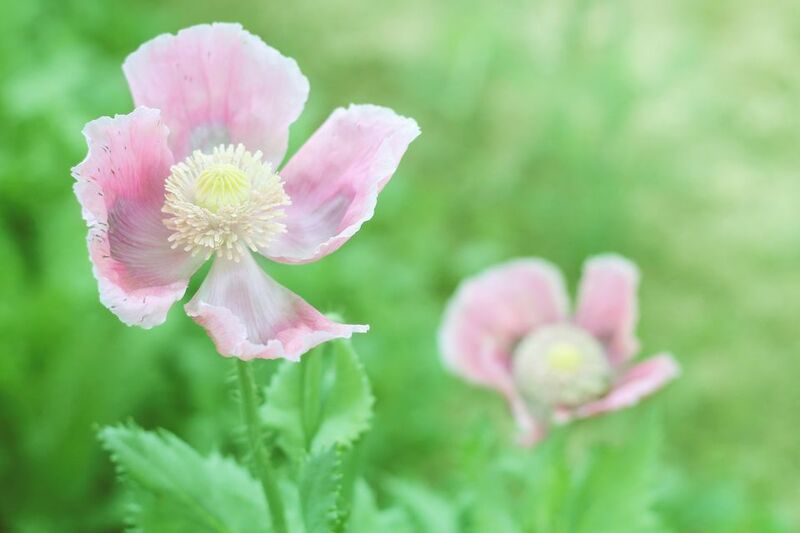 Hybridizing Oriental poppies started accidentally, when a British nurseryman, Amos Perry, happened to spot a salmon-pink flower sitting in the middle of his red poppies. He cultivated it and brought it to market as "Mrs. Perry". The most common Oriental poppy is still bright red with a black center, but the varieties keep expanding, with new colors, flowers with pinked edges or fluffy petals, and smaller, compact plants that don’t flop over. Leaves: Both the leaves and stems of oriental poppies are rough and bristly. The oblong leaves are deeply lobed and up to 12 inches long. Flowers: Each flower has 4 - 6 petals that are 2 - 6 in. across.. Many have a central dark splotch and dark stamens. Colors range from soft pastels to flashy brights and neons. Although they grow in USDA Hardiness Zones 3–9, Oriental poppies are often considered cool climate flowers. They do not thrive in extreme heat or humidity, which makes them difficult to grow in the U.S. south and in hardiness zones higher than 7. For the best flowers, give your Oriental poppies a full day of sun. They will bloom less profusely in partial shade. Mature height depends on the variety you are growing. Most Oriental poppies reach somewhere between 3 - 4 ft. tall, with a spread of 1 - 2 ft. However, there are several compact varieties that only reach 2 ft. in height. The bloom period for Oriental poppies is brief, but exquisite, in early summer. Some varieties will only stay in bloom one day, although with enough buds you should get at least 3 days of bloom. To extend the season, plant multiple varieties that bloom at different times. In their defense, the plants are interesting even before the flowers “pop” open, with their fuzzy, plumping flower bud. Oriental poppies need a well-draining soil. Their fleshy tap roots and crowns will rot in the damp soil. Wet winters can be a particular problem if the ground stays wet rather than freezing solid. Starting from Seed: The easiest way to start poppies is from seed. Direct sow early in the season. The seeds need light to germinate, so simply scatter the seed on prepared soil and firm it down lightly. Planting: Because Oriental poppies have a tap root, they don’t divide easily. To avoid disturbance, potted plants should be planted in their final growing spot. If you purchase bare-root plants, make sure the hole is deep enough to accommodate the root and that the crown will be 3 inches below the soil surface. If Oriental poppies are planted too shallowly, they can rot. Water: Once established, Oriental poppies are somewhat drought resistant, but they do best with regular water. An inch a week should do it. Fertilizer Give the plants a side dressing of compost or a light dose of balanced fertilizer in the spring. Maintenance: Poppies pretty much take care of themselves. Once the flowers have faded, the foliage goes downhill quickly and unattractively. The plants are ephemeral and eventually go dormant and disappear for the summer. Feel free to cut them back sooner than that, if you can no longer stand the sight. They will regrow in the fall, to gain strength for next year’s blooms. Tall varieties have a great tendency to flop over. Planting them among bushier plants that they can lean on will keep them upright. Division: Crowded plantings may need division every 5 years or so. The best time to divide is when the plants are dormant, in late summer, if you can find them, however, the taproot makes division tricky. Dig down deep, so that you get the entire clump and lift the mass of long, thin, carrot-like roots. To divide, use a knife to get through the roots, making sure each division has some taproot, some stem, and at least one eye. Re-plant immediately and remember to plant them about 3 inches below the soil surface. Winter mulching will help protect the roots and crown from rotting. Insects: Insects don’t seem to care for Oriental poppies. Maybe they aren’t around long enough for the insects to find them. Diseases: Fungal diseases and rotting can be a problem during a wet season. You can use a fungicide, if necessary. Oriental poppies have a brief but dazzling bloom period. Since their declining foliage is unattractive, they look best when tucked in with bushier perennials like peonies, campanulas, and iris. Or interplant them with later-blooming annual flowers. "Black and White" - aptly, if unimaginatively named, with clear white petals and a black center. "Mrs. Perry" - Mr. Perry’s old-fashioned salmon pink discovery. And among the von Zeppelin Poppies, with their unpronounceable names, are some of the best.